Welcome back Morcheeba. I thought I was never going to see you again but I took a chance and after giving away my copy of the Fragments of Freedom album to the local charity shop a couple of years ago-(hard to come back from that!) I have found a new respect for you. 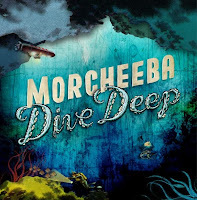 I'm a born again Morcheeba fan and Dive Deep is the reason why. I'm really enjoying the mood of this album, chilled out, trip hop, folky. Experimentally talking, it's a pretty safe album but hey if it sounds good, that's OK! The two Original Morcheebas, brothers Paul and Ross Godfrey have teamed up with a few different singers including Judie Tzuke, French singer, Manda, Thomas Dybdahl and hip hop figure Cool Calm Pete to produce some really nice work. Check out this great video directed by the animator Joel Trussell. I can definitely hear some Beth Orton /Dusty Springfield style vocals in this song Enjoy The Ride (featuring Judy Tzuke). A blinding track to kick off the album. Here's another track from Dive Deep, a cover version of John Martyn’s folksy Run Honey Run. A hint of Nick Cave/Roy Orbison in Thomas Dybdahl's vocals. To give you a flavour of how mixed this album is, here's another one of my favorite tracks called One Love Karma with Cool Calm Pete being particularly laid back. This track apparently (according to the Morcheeba Myspace page) incorporates the world's first ever recorded fluteboxing a human beatbox through a flute. If you want to catch Morcheeba on tour this year, there are loads of dates on their myspace page-sadly none in the UK. Dive Deep was released on February 4th 2008. What do you think of these tracks? Write a comment, would be great to hear from you! Thanks for posting these great tracks!